During my recent visit to Montreal I had really wanted to try a Tarte au Sucre. I had made one a tarte au sucre last year, and wanted to see how it compared to a traditional slice. While in the Jean-Talon market I went to one of the stalls that sold pies and asked if they had any tarte au sucre. The lady told me that they didn’t, but had a similar pie made with maple syrup. I was intrigued. That night we all had a slice of the pie. It was delicious. The crust was a standard pie crust, while the filling looked a little like a pumpkin pie filling. When I cut the pie maple syrup came seeping out of the filling. The flavor of the pie was intense. No hints or hidden tastes of maple syrup, this was straight up what you see is what you get maple syrup flavor. I knew after trying this pie that I had to make one when I got home. So before leaving Montreal I went to the market one more time, bargained myself a good deal on 5 liters of maple syrup, and made a little prayer the baggage handlers wouldn’t notice my bag being over the weight limit. I made it home with no extra baggage fees. A week after getting home I set off to make this pie! I like to make my pie crusts in a food processor, however you can do it by hand as well. Essentially combine the flour, sugar and salt. Then cut the butter into the flour mixture until pea size. Finally sprinkle the water into the mixture and mix a bit more. The mixture should now resemble a course meal. Form a ball with the dough, being careful not to overwork the dough. Finally form the dough into a disc shape about 1/2 inch thick, cover with wax paper, and place in the fridge for at least 1 hour before rolling. When you take the dough out of the fridge let it stand out for 2 minutes before you roll it as it will most likely be too hard for you to roll immediately. Preheat your oven to 400 degrees. Roll out your dough and place in a standard 9″ pie pan. Cover the dough with a layer of tin foil then fill the middle of the pie with dried beans. Place the pie crust in the oven for pre-baking. Let bake for 15 minutes to set the pie. Then remove the tin foil and the beans and lower the temperature to 375 degrees and bake another 10-15 until the pie crust is a golden brown. Remove from the oven and let cool on a wire rack. The base of this pie filling is a simple roux. Start by melting the butter over low heat in a heavy saucepan. Once all the butter is melted gradually stir in the flour. Once all the flour is added continue to stir for another 3-5 minutes until you have a roux. Next gradually add the milk and cream. Continue to stir the mixture until it becomes thick and creamy. Finally add the maple syrup and cook for another 10 minutes. The mixture should be silky smooth. Finally pour the filling into the pre-baked pie shell. Place the pie in the fridge to help set the filling. Leave it no longer than 1 hour in your fridge however, as the filling will begin to separate. Once the filling is set, leave at room temperature until it is eaten. If you have left over pastry you can roll it out and cut out leaves or other figures to place on your pie. I really loved this pie. 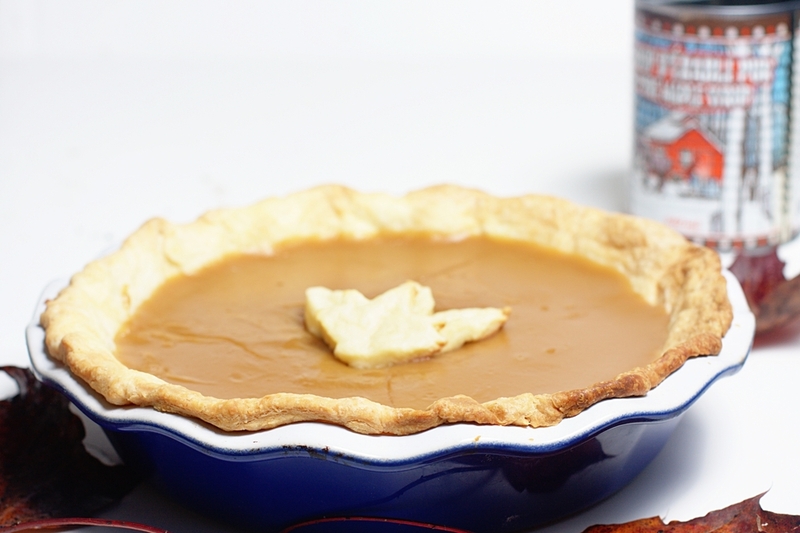 I had to make it in my Emile Henry pie pan as I couldn’t find a smaller glass pan, but it still worked out. 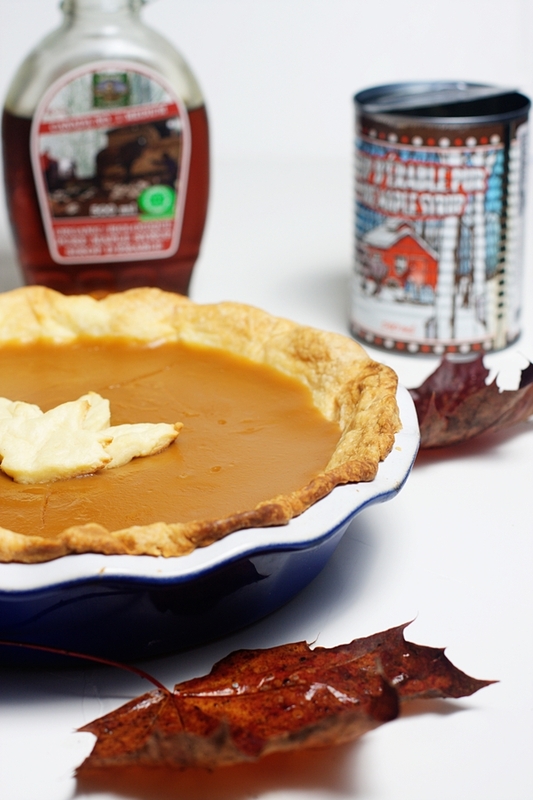 The pie itself doesn’t look incredibly amazing, however the taste is just fantastic if you love maple syrup. It is a pretty easy pie to make as well. I think I may attempt to make another Tarte au Sucre at some point again to compare with the maple syrup pie, however from what I remember this is my clear cut favorite of the two.